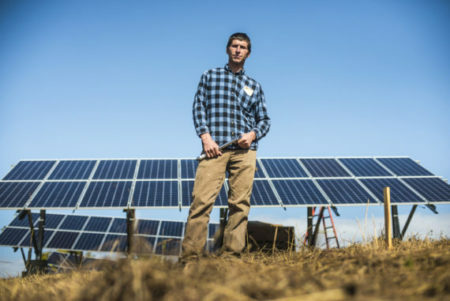 Dolf Ivener, founder of Sioux City, Iowa-based Hog Power Energy, is now plenty busy marketing his company’s Self-Contained Solar Generator (SCSG) to hog farmers . . . According to Ivener, the industry is sizable: 70,000 hog confinements exist nationwide, each one consuming 24,000 kw of electricity annually at a $184,000,000 price tag, averaging more than $2,600 annually. Add to this calculation, the cost of a generator averages $10,000, a machine which needs to be replaced within 10-15 years, plus maintenance. The hog industry has spent over $1,200,000,000 for new and replacement generators, which provide no energy savings. This is where Ivener has created a viable niche in the agricultural marketplace selling photovoltaic electricity. Read more. This entry was posted in Nebraska / Midwest News, NewsBlog and tagged CleanTechnica, Dolf Ivener, farm energy, Hog Power Energy, innovative solar energy businesses, Nebraskans for Solar, Self-Contained Solar Generator (SCSG) on September 30, 2016 by Helen Deffenbacher. Sens. Ken Haar of Malcolm and Tyson Larson of O’Neill heard testimony Wednesday from leaders from around the state calling for a response to the growing threat of climate change and an increase in energy from renewable resources . . . A group of students and faculty from Omaha North High School were at the hearing and a student, Gabriel Runyon, testified. 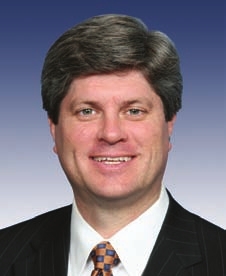 Runyon said committing to renewable resources and stopping the effects of climate change were important to his generation. Haar thanked him for testifying, and said that more young people should speak out, because elected officials would listen. Read more. This entry was posted in Nebraska / Midwest News, NewsBlog and tagged climate change, North Platte Bulletin, Omaha North High School, renewable energy development in Nebraska, Senator Ken Haar, Senator Tyson Larson on September 29, 2016 by Helen Deffenbacher. 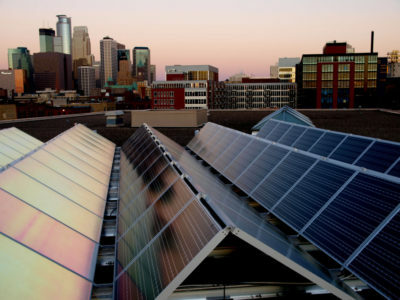 Solar projects are continuing to sprout up across the US, as WGL Energy and NRG Energy have paved the way for a slew of new installations in both Minnesota and Massachusetts. NRG announced Tuesday that it has broken ground on five community solar projects in Minnesota, while WGL noted that it has completed a 3.2MW PV plant in Devens, Massachusetts. NRG noted that all five Minnesota projects are expected to be completed by early 2017. The installations will be developed in Washington County, Dakota County, Goodhue County, Olmstead County and Dodge County — and will have a combined generation capacity of 29.1MW. Read more. Midwest Energy News’ 40 Under 40 award program highlights emerging leaders throughout the region and their work in America’s transition to a clean energy economy. The cohort of 2016 recipients are being announced on Sept. 28, Sept. 29, and Sept. 30. 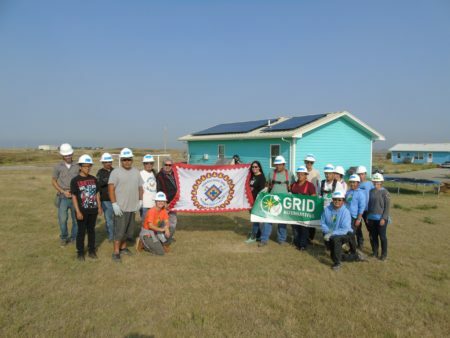 This entry was posted in Community-Scale Solar, NewsBlog and tagged ABC News, Midwest community solar development, Midwest Energy News' 40 Under 40 Awards, PV Tech on September 28, 2016 by Helen Deffenbacher. BROKEN BOW — Nebraskans may disagree over whether humans are causing climate change, say three state lawmakers, but they’re already seeing changes from all the talk in how they use, get and generate their electricity. If Nebraskans are wise, the lawmakers declared here Tuesday, they can generate another priceless commodity — rural jobs and economic activity — by tapping the state’s renewable-energy potential and upgrading buildings’ energy efficiency with help from a newly approved financing tool. Click to read more. Photo: Several solar energy projects have come online in Custer County over the past year, including this 650-kilowatt array on the Blakeman Ranch. Courtesy of Innovative Solar LLC. 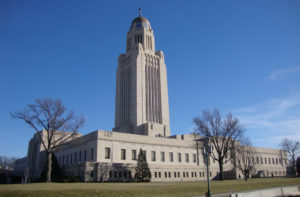 This entry was posted in Nebraska / Midwest News, NewsBlog and tagged energy efficiency & solar energy financing, Nebraska legislative committee hearings, Nebraskans for Solar, North Platte Telegraph, Property Assessed Clean Energy (PACE) Financing, solar energy & economic development on September 28, 2016 by Helen Deffenbacher. 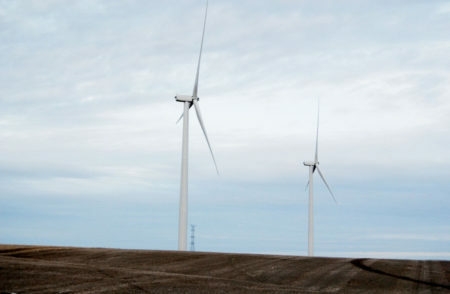 Earlier this month, the South Sioux City Council unanimously agreed to, along with Green Star Energy Group LLC, apply for a $200,000 Nebraska Environmental Trust grant for a proposed $290,000 turbine . . . Other actions planned or taken by the city include the purchase of electric cars for use by city employees, the purchase of solar and wind power and construction of a private solar farm. In a unique, additional step, the city will produce electricity for its Scenic Park campground by burning fallen tree branches, limbs and brush it collects along the riverfront and across the community. Read about additional initiatives here. Photo by Justin Wan, Sioux City Journal. 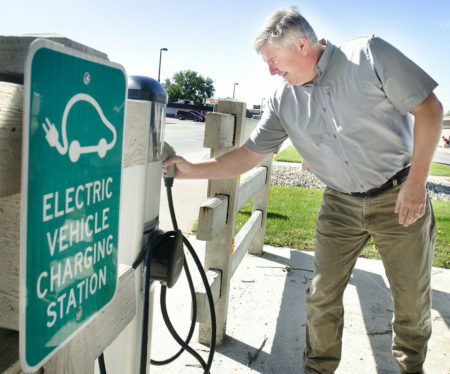 South Sioux City senior code official Kent Zimmerman demonstrates the electric-car charging station in front of City Hall in South Sioux City in September 2015. Electric cars for city employees is one component of the city’s commendable renewable energy strategy. This entry was posted in Nebraska / Midwest News, NewsBlog and tagged renewable energy development in Nebraska, Sioux City Journal, Sioux City Journal Editorial Board, South Sioux City - a model for other Nebraska communities, South Sioux City's innovative renewable energy initiatives on September 27, 2016 by Helen Deffenbacher.